Today, I am going to share my experience with the Vaadi Herbals second product i.e. Amla-Shikakai Shampoo. Earlier, I shared my experience with the Vaadi Herbal's Neem Patti Soap. My experience with Neem Patti Soap was good and I am happy to say that my experience with Vaadi Herbal's Amla-Shikakai is even better. I am using this product from last two years and it has become an important tool to care my hairs. I am a great fan of Ayurvedic products because I want to keep away chemicals from my body as much as possible. One day, I just saw an offer on an online store about this shampoo with great discount and therefore, I decided to give it a try. In the initial offer, I got six Amla-Shikakai shampoo packs and they lasted for few months. My experience with this shampoo was so good that I decided to buy it again. The main ingredients of the Amla-Shikakai Shampoo are Amla, Shikakai, Triphila, Aloe Vera, Soy Protein and Reetha. Amla provides strength to hair and it stops the hair fall. Shikakai works as a conditioner and it softens the hairs. Reetha in the Shampoo gives shine and bounce to hair. In addition to these three, ingredients like Soy Protein, Aloe Vera and Triphla provide extra nutritions to the hair. The good thing about this Shampoo which I liked most is that you can use it on a daily basis because it is very mild. The other members of my family have also liked this Shampoo and it is very economical and better option available in front of us as a Shampoo. 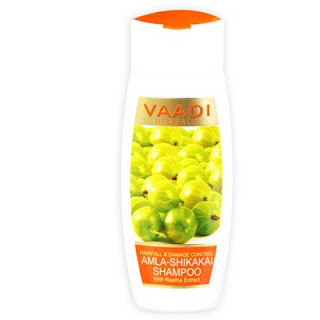 The Vaadi Herbal Amla-Shikakai Shampoo is available in two sizes of 110 ml and 350 ml at a MRP of Rs 59 and Rs 155; though, we can find some discounts and deals on the online stores. Vaadi's Herbal Shampoo even helped me in dandruff control which I failed to achieve with other branded Shampoos. Therefore, I will like to recommend this product to others and my rating for it is 8 out of 10. Though, like the Neem Patti Soap, Vaadi's Herbal Shampoo does need improvements. Sometimes, the mixture of shampoo is so thick that you need to add warm water to it before using it. Vaadi can make it more refined product like the other Shampoo brands.